Marine LitterWatch (MLW) has been developed to target communities interested in marine litter activities. Communities are organised volunteer groups of citizens, such as NGOs, civil society associations and other kinds of informal groups. Although citizens can also join MLW independently, the full potential of citizen engagement can be best harnessed by more and more citizens joining existing communities, or creating a new community. Find out if your community is already part of the MLW users’ network by checking the community list. If it is not and you would like it to be, just send us an email and help us improve our knowledge about marine litter in Europe. Communities can organise two different types of events through the MLW app: monitoring events or clean-up events. In order to use the data to support official monitoring purposes, monitoring events have to follow the Marine Strategy Framework Directive (MSFD) monitoring protocol for beach litter. Monitoring events need to happen on a regular basis and take place at the same location on the beach. As such, they require a community structure and set-up that will ensure proper quality assurance of the data. Clean-up events may be ad hoc or periodic. They are easy to organise and aim to raise awareness about marine litter. The data generated through clean-ups will also support assessments on the state of European coasts and seas, including those prepared by the EEA. More information on how to set up events can be found in the MLW under monitoring or clean-up events. The app allows for the creation of surveys on litter items found on the beach. It uses the Marine Strategy Framework Directive list of marine litter items that has been harmonised across Europe. These are items currently found on Europe’s beaches, for example, plastic items, cigarette butts, bottles, fishing materials, etc. More information on how to use the app can be found in the MLW guidelines. The data collected from both monitoring events and clean-up events is stored in a public database hosted by the EEA. Data from monitoring events (which will be made available to support official monitoring purposes) are quality assured by the responsible community members prior to their publication online. All MLW data will be made accessible online and free of charge for national authorities, research communities and citizens alike. Communities can retrieve their data through a web interface and use it in other databases and / or elaborate it further into a wide range of products such as survey reports and maps. EEA data policy is available here. European citizens to help tackle marine litter Litter, plastics in particular, is accumulating in our seas and coasts mainly due to current unsustainable consumption and production patterns, poor waste management and the lack of public awareness. Marine litter is an increasing threat to the marine environment, to human health and our well-being. It has cross border impacts on wildlife and habitats. Without tackling marine litter, Europe cannot have healthy seas. New mobile phone app will help track marine litter People will soon be able to report the litter they find on the beach, thanks to a new mobile phone app developed by the European Environment Agency (EEA). Europe's seas: A valuable asset that must be used sustainably Many of Europe's marine species, habitats and ecosystems have been threatened for decades. As maritime economic activities are predicted to increase in coming years, a new briefing from the European Environment Agency (EEA) argues that the cumulative impact of human activity should be better managed to avoid irreversible damage to ecosystems. What are the sources and impacts of marine litter? Increasing amounts of litter are ending up in the world’s oceans and harming the health of ecosystems, killing animals and putting human health at risk. The solution lies in waste prevention and better waste management on land. Marine messages Europe's seas are home to a rich and diverse array of species, habitats and ecosystems. Although vital for Europe's economic and social wellbeing, many of these ecosystems risk being irreversibly damaged by human activities. 'Marine messages', a briefing from the European Environment Agency (EEA), provides an overview of the current state-of-affairs of European seas and our use of them. It argues that economic activities including transport, fishing, offshore energy and tourism should be better managed so that they ensure sustainable health of marine ecosystems. Balancing the future of Europe's coasts — knowledge base for integrated management The objective of this report is to frame an analytical approach for coastal areas in Europe, and to place this in the context of the new socio‑economic drivers of sustainable growth, and the formation of a new integrated policy framework. This framework builds on an ecosystem‑based management approach and integrated spatial planning and management. The report presents some key sustainability challenges for European coastal areas and waters, and highlights the need for a consolidated knowledge base and widespread information‑sharing to support informed policy development and management actions. List of communities Marine LitterWatch aims to connect citizens to their local communities engaged on marine litter activities, or inspire new ones to form. In the table below you can find contact details of the communities that have joined Marine LitterWatch (MLW). EEA data policy The policy provides guidelines about EEA’s handling of data. It will ensure that data is handled in a consistent and transparent manner. EEA aspires to promote the sharing of environmental data. In agreeing to share, data providers need to have assurance that their data are properly handled, disseminated and acknowledged following similar principles and rules across countries and stakeholders. 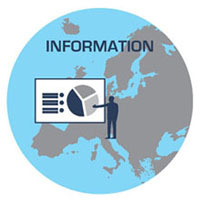 Shared Environmental Information System (SEIS) The "Shared Environmental Information System (SEIS)" was established to improve the collection, exchange and use of environmental data and information across Europe. SEIS aims to create an integrated, web-enabled, EU-wide environmental information system by simplifying and modernising existing information systems and processes. For references, please go to https://www.eea.europa.eu/themes/water/europes-seas-and-coasts/assessments/marine-litterwatch/get-started/how/how-does-it-work or scan the QR code.